Your water heater works to provide you with constant hot water. But what should you do when your water heater fails? In the case that your water heater is beyond repair, we’ll work with you to determine a solution that best fits your needs and budget. Although it may cost more upfront, it is cheaper in the long run to replace your water heater than it is to keep using your inefficient one. Whether you need a repair or simply the installation of a new one, Chelsea Cooling and Heating is staffed with courteous and friendly technicians who are ready to answer all of your questions and concerns. We offer fast service on all major brands and types of water heaters. We’ll get your water heater installed safely and efficiently, while making sure it meets all codes and regulations. If any problems arise, we will provide you with any necessary follow-up evaluations to ensure your complete satisfaction. We offer fast service on all major brands and types of water heaters. We’ll get your water heater installed safely and efficiently, while making sure it meets all codes and regulations. If any problems arise, we will provide you with any necessary follow-up evaluations to ensure your complete satisfaction. Reduce energy costs and maximize efficiency by installing a tankless water heater. With tankless water heaters, you’ll never have to sacrifice comfort or convenience. Our licensed, expert technicians have the expertise and knowledge to help you decide on a water heater solution that’s best for you. 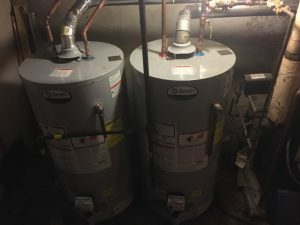 Call us and let our technicians take care of your water heater installation today!